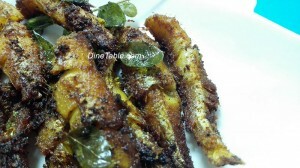 Kerala fish fry has a unique taste and Netholi meen varuthathu is a popular side dish in India, Kerala. Netholi is A.K.A Anchovies and it is high in packed with vitamins, minerals, proteins etc. It is good for skin. eyes, bones, teeth and contols heart diseases. For making this recipe, the effort is very less. It is little spicy but amazingly tasty. You can use this recipe to fry any fish. Make a fine paste of all the ingredients and apply on the fish. Marinate for 1/2 an hour. Heat oil in a pan and deep fry the Netholi fish ( നെത്തോലി മീൻ ) by turning to both sides. Once the fish is half fried, add some curry leaves to get a unique flavor. Your spicy, tasty and easy Kerala fish fry / Netholi meen porichathu is ready to serve hot with rice and variety of breads!!! !